Feuding families and they are next door neighbors too! These young family members are seeing the way the future is changing over to machines and the way of the past is not easy to let go by the older members. I enjoyed the story as we read about the struggles of weavers fighting the switching over to machines and losing their income and family legacies. Murder, suspense and a touch of romance made for a wonderful story. Kate’s loyalties bind her to the past. Henry’s loyalties compel him to strive for a better future. In a landscape torn between tradition and vision, can two souls find the strength to overcome their preconceptions? Loyalty has been at the heart of the Dearborne family for as long as Kate can remember, but a war is brewing in their small village, one that has the power to rip families asunder –including her own. As misguided actions are brought to light, she learns how deep her father’s pride and bitterness run, and she begins to wonder if her loyalty is well-placed. Henry Stockton, heir to the Stockton fortune, returns home from three years at war seeking refuge from his haunting memories. Determined to bury the past, he embraces his grandfather’s goals to modernize his family’s wool mill, regardless of the grumblings from the local weavers. When tragedy strikes shortly after his arrival, Henry must sort truth from suspicion if he is to protect his family’s livelihood and legacy. Henry has been warned about the Dearborne family. Kate, too, has been advised to stay far away from the Stocktons, but chance meetings continue to bring her to Henry’s side, blurring the jagged lines between loyalty, justice, and truth. Kate ultimately finds herself with the powerful decision that will forever affect her village’s future. As unlikely adversaries, Henry and Kate must come together to find a way to create peace for their families, and their village, and their souls – even if it means risking their hearts in the process. 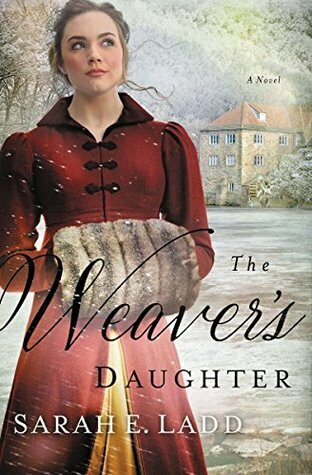 This entry was posted in Christian Historical fiction, Regency, Reviews and tagged #NetGalley, Christian Fiction, Regency Romance, Sarah E Ladd, The Weaver's Daughter, Thomas Nelson.